We are glad to announce our participation in MWC Barcelona 2019 after our debut last year. We look forward to seeing you at our booth 6 L10 Hall 6. Indiasoft is a huge business networking event that entertains global buyers and helps Indian IT companies in building a strong foothold globally. This year the event will take place on Feburary 4th and 5th, 2019 at HICC, Hyderabad, Telangana, India. And after making a remarkable presence in the last 8 years in Indiasoft, we are again ready to take part in 2019, at stand no 19. Read more here. Appfutura - a renowed community for mobile app developers, has recently released a comprehensive list of top 20 Blockchain App Development Companies - October 2018, around the world and we are proud to be a part of that list. Blockchain has become one of the most emergent technologies during these last years and our developers at CDN Solutions Group are well versed with this skill. We are thankful to Appfutura for recognizing our talent and work in this field. Read more here. We are proud to be listed in the Top 15 Blockchain Development Companies Worldwide by Goodfirms, a full-fledged research and review platform that helps buyers of professional services and businesses to opt for the best software design, development and marketing services. Currently, Python is the most popular programming language that is growing rapidly at an impressive rate. And our developers at CDN Solutions Group are well versed with this skill. 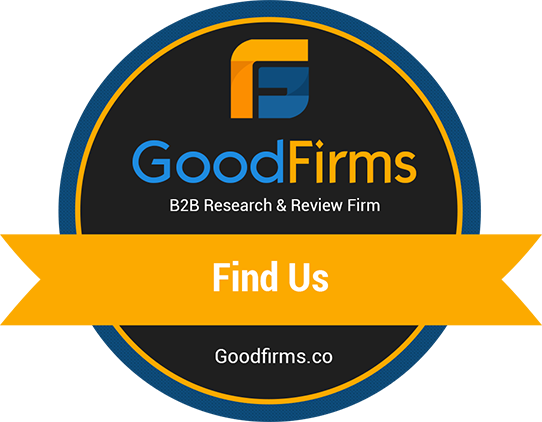 We are thankful to GoodFirms for recognizing our talent. Read more here.